As the child of immigrant parents who worked multiple jobs to make ends meet, Assemblyman Jimmy Gomez can still vividly recall the joy he felt during years when he was lucky enough to receive one toy during Christmas. “That was a big deal,” he reminisced last Friday as he prepared to welcome nearly 2,000 children and their families to the 3rd Annual Holiday Toy Giveaway in El Sereno. “I know one toy could mean a lot to a child,” Gomez told EGP as the young boys and girls excitedly waited for their visit with Santa Claus. “I want to see the toys!” children could be heard telling their parents as they jumped up and down to get a closer look from their place in line. Arlene Hernandez and her five children held the coveted first place in line, which extended down Rosemead Avenue. She told EGP she heard about the event while at the Barrio Action Youth & Family Center where two of her children receive tutoring. “It’s exciting and I feel grateful because there’s a lot of people who don’t have money for gifts,” she said. “It’s generous that [the assemblyman] is doing this,” she added. Once inside, Hernandez’ children and the many children who followed excitedly scanned tables filled with toys lined up around Barrio Action’s gymnasium. What they saw were dolls, plush animals, rattles, board games, cars, superhero figures and much more. “This is my second year coming and I like that it is getting bigger and bigger,” reflected Hernandez as she looked out at the tables filled with toys separated by age. According to Gomez, when he was elected to the Assembly in 2012 he made a commitment to give back and stay visibly active in his district, which includes much of east and northeast Los Angeles. “I want to make sure we are giving people a little bit of hope during the holidays,” he explained about his involvement in the charitable event. 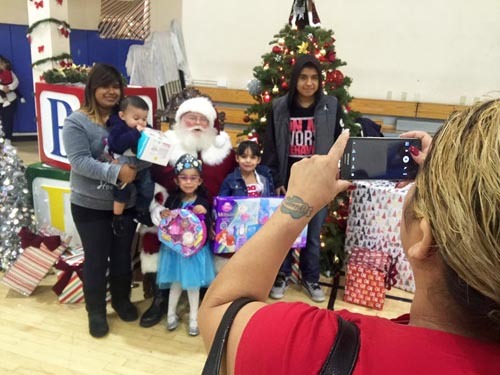 A successful toy drive and sponsors, Time Warner, Barrio Action and other organization, made the giveaway possible, according to the assemblyman’s office. As Teresa Garcia waited in line with her three children, two nieces and a nephew, she told EGP her teenage daughter takes anti-bullying classes at Barrio Action, and that’s where they heard about the toy distribution. Like so many others, they patiently waited, vouchers in hand, for their turn to pick up their toy. 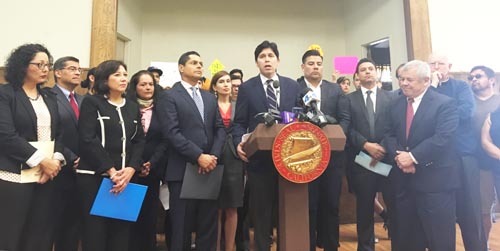 Barrio Action Executive Director Tammy Membreno told EGP they worked with Assemblyman Gomez to bring a little happiness to families living in the area. “We can’t take families out of poverty, but we can lift a burden off them by providing toys for their kids,” she said, emphasizing that many of the parents they see are young and providing them with toys to give their children is a great help. After all, “It’s about compassion during the holidays,” she said. Gomez — recalling how as a boy he wished with all his heart to be next to Santa Claus —couldn’t resist the urge to take his own picture with Santa, this time with a little tweak to the traditional pose, with Santa sitting on his lap to ask for something special this holiday season. Santa’s request? For Gomez to keep fighting in the assembly for California families.